Today in Australia, August 26th is Daffodil Day. The Daffodil is the international symbol of hope for all those touched by cancer. 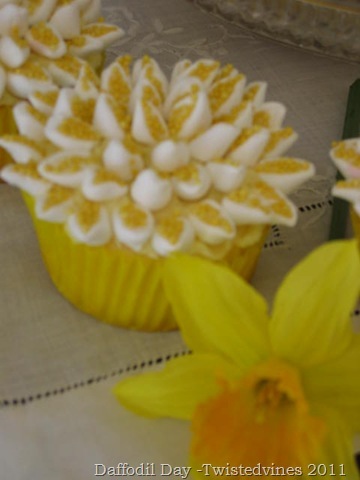 So today my life is touched with golden yellow flowers, of Daffodils, sunshine, cupcakes and marshmallows. The daffodil is a sign of HOPE for a brighter, cancer free future, and funds raised today are essential for cancer research, prevention and support services. Fresh Daffodils were on sale at retail outlets, and for every fresh bunch sold $1.00 (Aus) was given to the Australian Cancer Foundation. Theres every chance within our lifetime, our lives will be touched by cancer, either directly or through the experience of family and friends. So I’m sharing some golden sunshine with you, friends. 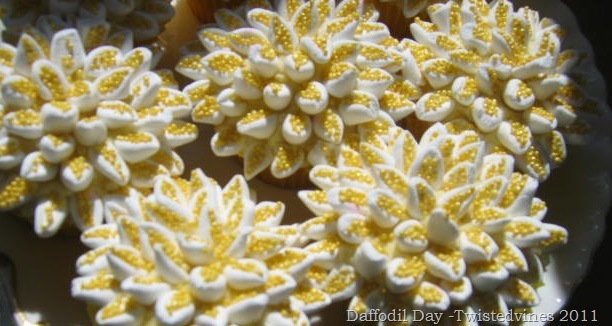 How about trying these wonderfully decorated cupcakes. Aren’t they just special. I’ve seen these before around blogland and have been wanting to try them for some time.You’ll enjoy this video found here and its even more enjoyable making them. Firstly make a basic cupcake recipe.My favourite one bowl wonder plain cake mixture recipe found here. Then make a vanilla frosting. Cut each mini marshmallow on the diagonal forming the petal shape. 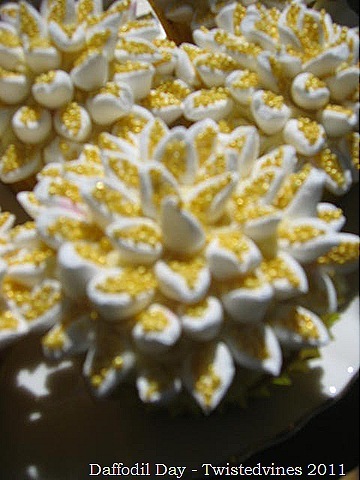 Coat each petal in coloured sugar.Using the flat side, start on the outer surface of the cupcake gradually working towards the centre. I know you’ll agree they look FUNtastic. 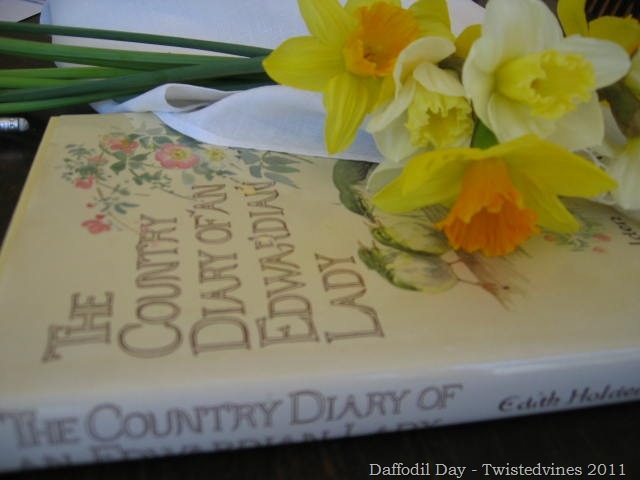 A beautiful illustrated book is that of The Country Dairy of An Edwardian Lady.She writes of daffodils..
It’s a beautifully illustrated and written book, and I’ll try and do a review on it soon. I hope I’ve bought a bit of sunshine into your day, and if yellow makes you happy, support Daffodil Day. It is so sad how all of our lives are touched by cancer. 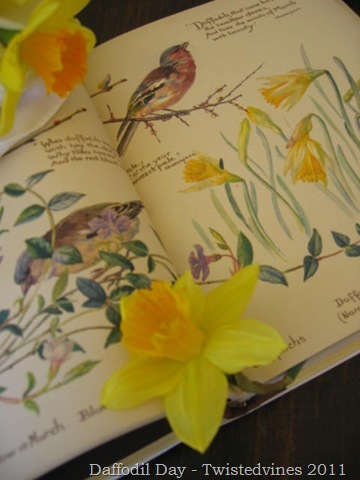 I don’t know much about flowers so not sure if I will find daffodils today when I head into town to fetch Pete at the airport – will scout around. Your cupcakes are absolutely fantastic – beautifully done! These are beautiful… and such a lovely way to honor cancer survivors and patients. Great post… had to share on Facebook! Beautiful, Yvette! 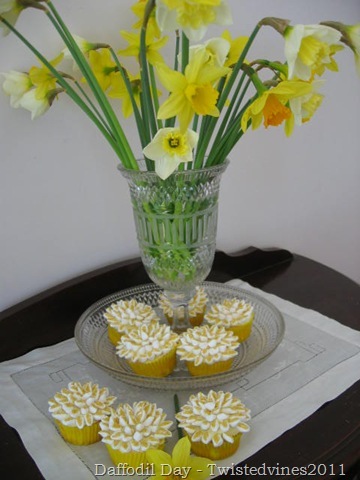 The photos are beautifully taken of the daffodils and book, and the cupcakes are wonderful. That must have taken you a lot of time. 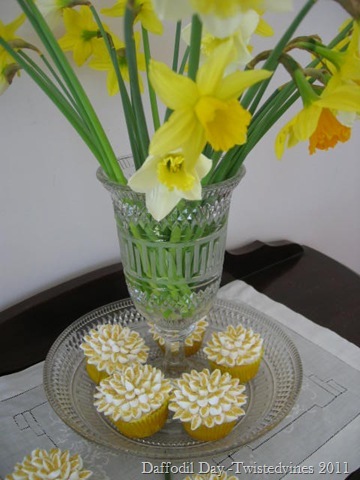 I love daffodils and always buy loads for the house when they are in season in the Spring. The cupcakes look so wonderful and the photos too! Have a great day. Shared on Twitter and on my blog also. I love those mini marshmallows.. in the shape of a flower. Beautiful Those cupcakes look good enough to eat. Love this post. We have our Daffodil Day for Cancer here in Canada during the month of March. Your cupcakes looks so cheerful and yummy. The sunshine yellow of Daffodils is inspiring, making them the perfect ambassador of hope for all those touched by cancer. 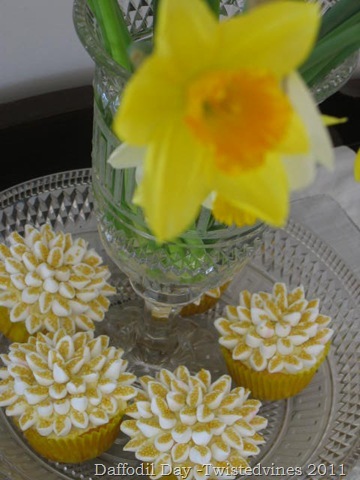 What a perfect way to celebrate Daffodil Day…..gorgeous cupcakes. We have Daffodil Day in Canada in April. These cupcakes are beautiful! I’m going to follow the link for the instructions 🙂 I see a wonderful apple cake below that I’m going to follow too. I am so envious that you have a fig tree! Yvette~ What a wonderful fresh breath of spring from your part of the world! We are surrounded by drooping, tired flowers & plants after a long, HOT summer! What a beautifully illustrated book too! 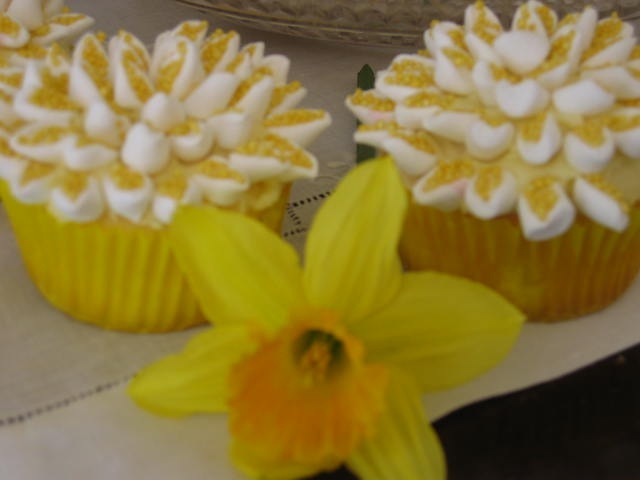 I haven’t made those flower petal cupcakes yet but I have a bag of mini marshmallows in the pantry waiting for me 🙂 Happy Belated Daffodil Day to you!